Officials from South Korea and Japan held meetings Monday amid deteriorating relations over recent rulings that ordered Japanese firms to compensate South Koreans forced into labor during Japan’s occupation of the peninsula. Kim Yong-kil, director-general for Northeast Asian affairs at Seoul’s Foreign Ministry, met with Japanese counterpart Kenji Kanasugi in Seoul to discuss the ruling in favor of South Korean victims, as well as a South Korean destroyer’s naval operation in the East Sea. “We explained to Japan’s side about factual relations we found out,” Kim told reporters after the meeting, adding both governments will continue consultations on the issue to mitigate diplomatic fallout. South Korea voiced strong regret over Japan’s unilateral claim to the media about Seoul’s naval operation, a Seoul official said on condition of anonymity. South Korea’s Ministry of National Defense said its destroyer performed a routine operation to track a North Korea ship drifting in the East Sea. It said the naval ship did not use the fire-control radar, but only used an optical camera to identify the Japanese aircraft approaching it. “Our military carried out a normal operation for the humanitarian rescue operation, and it has never taken any step that would make the Japanese side feel threatened,” Col. Lee Jin-woo, deputy spokesman of Seoul’s Defense Ministry, said Monday. Japan’s strong protest was largely seen as an indication of complaints over the South Korean government that has yet to take action on the forced labor rulings. “On the forced labor rulings, both governments exchanged their positions, and agreed to closely communicate in order to minimize the negative impact of the issue on South Korea-Japan ties,” Kim told reporters after the meeting. “Both sides agreed to make efforts to develop future-oriented relations despite problems concerning historical issues between South Korea and Japan,” he added. Tensions between the neighbors spiked after Seoul’s top court made two separate rulings ordering Japanese firms -- Mitsubishi Heavy Industries and Nippon Steel & Sumitomo Metal Corp. -- to compensate South Koreans forced into labor during Japan’s 1910-45 occupation of the Korean Peninsula. Tokyo has denounced the ruling as “unacceptable,” saying all wartime reparations had been settled under a 1965 treaty that normalized diplomatic relations between South Korea and Japan. Tokyo offered $500 million in grants and low-interest loans at the time, which contributed to Seoul’s economic takeoff. Seoul set up a committee under Prime Minister Lee Nak-yon to draw up follow-up measures to respect the judiciary’s decision without further damaging bilateral ties. The government is “extensively and carefully” reviewing what steps to take next, according to an official. The meeting Monday comes on day of a deadline set by lawyers representing South Korean plaintiffs. The lawyers said they would start procedures to seize South Korean assets if Nippon Steel & Sumitomo Metal Corp. failed to show willingness to compensate the victims. The Japanese government earlier said it would consider seeking international arbitration if the court went ahead with seizing Nippon Steel’s assets in South Korea. Nippon Steel’s assets in South Korea include shares of PNR, a joint venture between Nippon Steel and South Korean steel company Posco, and intellectual property the company owns here. 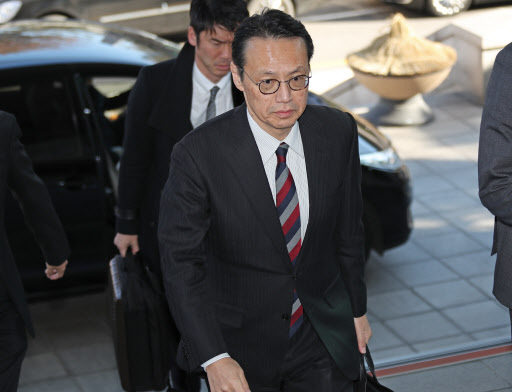 Kanasugi, who doubles as Tokyo’s top nuclear envoy, also met Lee Do-hoon, special representative for Korean Peninsula peace and security affairs, to discuss recent developments on denuclearization negotiations with North Korea. Despite the escalating diplomatic row, South Korea and Japan are seeking to forge forward-looking relations on the fronts of security, economy and culture, separating contentious issues over a shared history.